A president and a King. 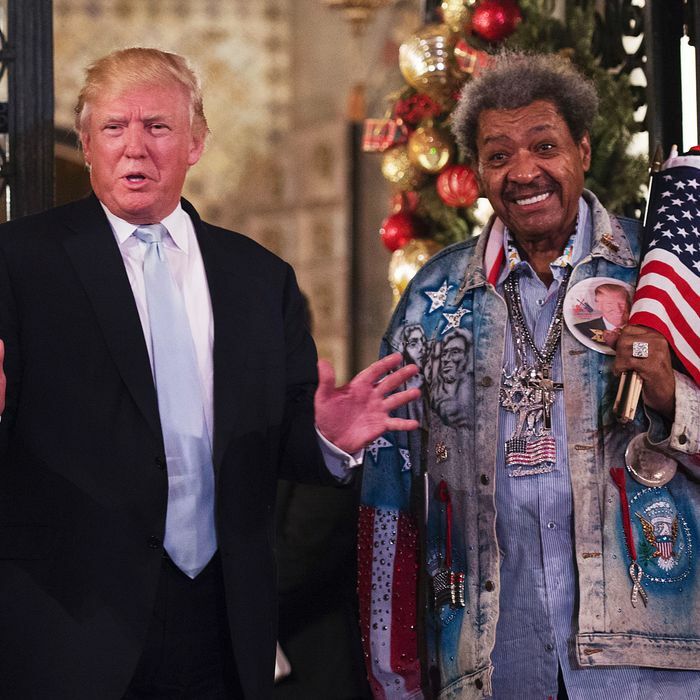 If Donald Trump never got the crazy idea to run for president, there’s a decent chance he would occupy the same space in our collective cultural consciousness as Don King, the shock-headed fight promoter who rose to prominence in the ’70s and ’80s. But instead, one of these flamboyant narcissists with a checkered legal past is the president and the other one has become an occasional, unofficial adviser. King, who considers himself a “Republicrat” and has ceramic elephant and donkey statues in his garden to honor that label, backed Trump’s candidacy and introduced him last year at an event in Ohio, where he said the N-word before bringing Trump onstage. He was also considered for a speaking slot at the Republican National Convention. That never materialized, he told Politico, because Trump’s now-chief of staff “Reince Priebus said I was a convicted murderer,” King said. The 85-year-old was convicted of second-degree murder in 1967, but was pardoned 16 years later. Despite the misgivings of Preibus, who King called a “little Greek rascal,” Trump has kept in touch with King since taking office and has solicited his thoughts on at least one of the biggest decisions of his presidency. KING: I been to Mar-a-Lago [a few times]. We sat down for one hour [earlier this year]. He wanted to get my estimation of what’s going on. He said, ‘What you think about me firing Flynn?’ I said, ‘With all due respect, Mr. President, Flynn fired himself.’ … Trump’s loyal to a fault. He’ll speak on your behalf because, out on the street, you can stick with a guy and say he did the wrong thing, but he’s basically a good guy. … That’s not crooked, that’s not obstructing justice … That’s friendship. Like Trump, King thinks the media and “the Establishment” are aligned against the president and lying to try to take him down.